The United States- based striker Trina Davis scored three goals on her debut for Fiji in the 5-1 win over Vanuatu on Friday. 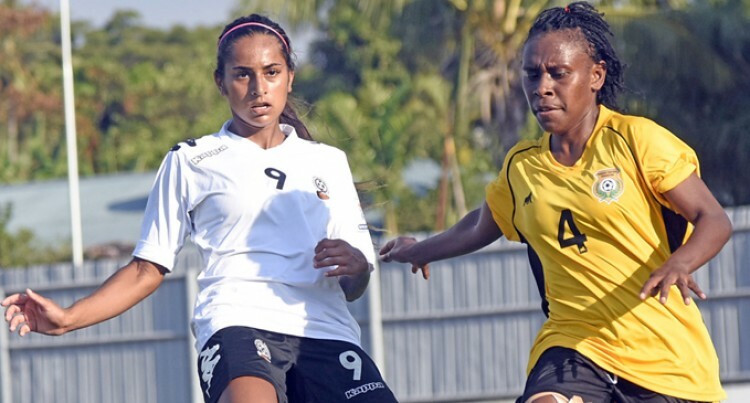 And Vodafone Fijian women football coach Marika Rodu is impressed with Davis in round one of the OFC Women Nations Cup (OFCWNC) 2018 qualifier at Churchill Park Lautoka. “It makes me feel really proud and happy to get to show people what I am capable of,”Davis told OFC Media. Davis’ journey to Fiji began while she was playing college football at Grambling State University last April. The Grambling State coaching staff had a connection to the Fijian team, and after learning Davis’ Indo-Fijian ethnicity, Davis’ path to Fiji began. After exchanging emails and sharing her video highlights, Davis impressed coach Rodu and she was called in to join the team. “I was honestly shocked, I couldn’t believe that I would have an opportunity to repre­sent mum’s country,” she said. Davis already has established a legacy at Marysville Pilchuck. She’s the football pro­gramme’s all-time leading scorer with 36 goals. She owns the school’s 100-metre track and field record and has received multiple acco­lades for her athletic achievements. It hasn’t been a simple journey to wearing the sky blue however with Davis having to organise her Fijian citizenship and pass­port before she was eligible. She also had to undergo an MRI to ensure the injured knee she had been nursing was back at 100 per cent. Having cleared those hurdles, Davis made the globetrotting trip to join the women’s national team. Rodu has been happy with Davis’ integra­tion into the team. “She has definitely brought in lots of expe­rience up front with her speed and skills,” said Rodu. Davis’ mother Vikashni moved to America as a 22-year-old and has always done her best to teach her children about the Fijian side of their culture. Twice previously Trina has visited Fiji, but her last trip was in 2011. “My mum talks about Fiji all the time,” Trina said. “My mum was telling me songs I should know, like the Fijian national anthem. A downside to Trina’s trip is the ramifica­tions it has for her pre-season training back in the US. She expects to return before Marysville Pilchuck’s first game but needs 10 practices before she can play and therefore will miss several regular-season games. The choice wasn’t easy for Trina, who clearly described her love for high school football but she couldn’t pass up the chance to compete at such a high level and so inti­mately connect with her culture.